The more astronomically-aware of you will already know that today is the vernal equinox. In some countries, including the US, the vernal equinox (or a day near it) is the first day of Spring, though we in Australia have reverted to the first of the month. Some say the precise moment of the equinox is the only time you can balance an egg on its end, but others have found that you can do it any old day, if you care enough. The precise moment of the equinox this year was 22:23 22-Sep-05 Coordinated Universal Time (more appealingly called “Zulu time”), or 8:23 this morning Australian Eastern Standard Time (more conveniently called “local time”). That means that, in theory, today will have more-or-less exactly twelve hours of day and twelve hours of night. However, according to Geoscience Australia, the sun rose in Sydney at 5:44 this morning and will set at 5:52 this evening, making the day about eight minutes longer than the night. Is this a sign of how brilliant our town is—it’s sunny here even when it’s supposed to be night-time? Or is it an example of slippery maths, like that stupid missing dollar puzzle? Well, both and neither. But mostly neither. It seems that the equinox-measuring folk are talking about the time when the midpoint of the sun’s disc passes the actual horizon, whereas the sunrise-and-sunset–brigade measure the time when the top of the sun appears or disappears over the observed horizon, which is distorted by the atmosphere. As always, USA Today gives us all the facts with handy diagrams. Some of you may also have noticed that my novel-in-verse Equinox is now over. Thank you for reading it all, if anyone did. It was fun (for me) to have new sonnets turning up every day; sometimes they seemed to have some obscure relevance to the actual corresponding day. If you wanted, you could check out the entry for your birthday; it might tell you something astonishing—purely by chance, but still. I think my favourite day was 18/9. I am looking at options for a print version and will of course announce any progress on these pages. 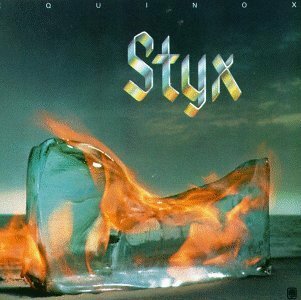 More of you may have noticed that the “E” is missing from the title of Styx’s classic 1975 album. I cannot explain this. But I can point you in the direction of Jean-Michel Jarre’s 1978 album Equinoxe, which clearly has an “E” to spare.